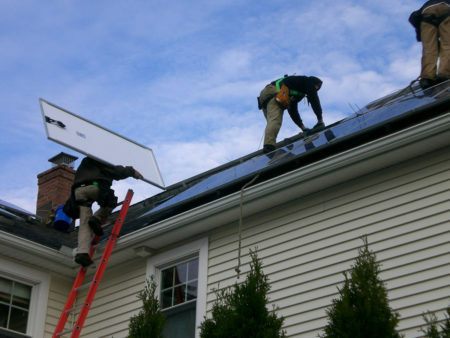 States across the Midwest are updating their interconnection rules for solar customers, a process likely to cut the time and money required to establish a connection to the grid. In addition, the new standards will equip utilities to efficiently process solar applications as their numbers likely escalate in coming years, according to an attorney who worked on revisions recently approved by the Iowa Utilities Board. Updated and improved interconnection standards are “a critical part of moving distributed generation ahead.. And having clear, fair and efficient interconnection rules is critical to enabling a healthy distributed generation market,” said Sky Stanfield, an attorney who was involved in negotiating the new standards. In March Green Bellevue presented the workshop, “Solar Powering Your Home,” co-sponsored by the Green Omaha Coalition and Nebraskans for Solar. If you missed it, you can watch it on YouTube here. Updated Information: Regarding the discussion toward the end of the video about interconnection, OPPD is offering solar installers and code inspectors training on this process. Undoubtedly, this will make it more streamlined and customer-friendly, and OPPD is to be commended for taking this step. This entry was posted in Installation, Nebraska / Midwest News, NewsBlog and tagged Green Bellevue's YouTube Video - Solar Powering Your Home, Karen Uhlenhuth, Midwest Energy News, Nebraskans for Solar, Omaha Public Power (OPPD), updated and improved interconnection standards in Midwest states on April 14, 2017 by Helen Deffenbacher.